Have you ever noticed how happy and excited little children can be? Their laughter and smiles can be contagious, right? Why is does it seem to be so difficult to stay happy as we grow older? In my workshops I always ask people if they would like to receive tips on how to achieve a greater level of happiness. It is interesting for me how they respond and I have to say that people become “alive” when I speak about that. Happier people are more productive but that’s not why I bring it up. I simply believe that all of us deserve to be happy and happiness is an “inside job”. I collect as many ideas as I can so that I can share it with the people who are in my circle of influence. 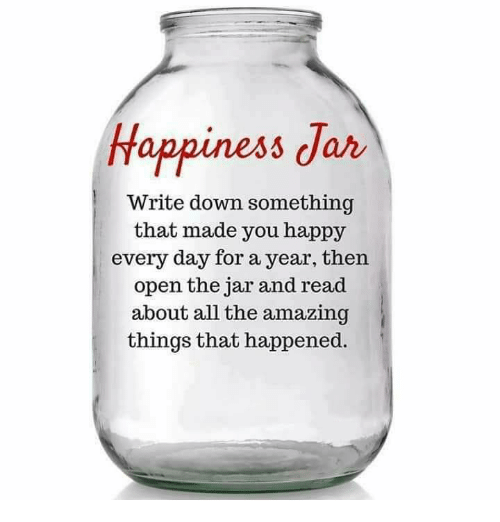 The “happiness jar” is one of them. What makes YOU happy? You could do this alone or even make it a family activity. Do you want some ideas what you can do? Start collecting the small and big enjoyments in your life. Come on, say “yes”! Happiness isn’t only for kids.